The 61st Annual Grammy Awards wrapped up in February, and now is your chance to catch up with some of the critically-acclaimed recordings that you may have heard about but haven’t had a chance to audition yourself. 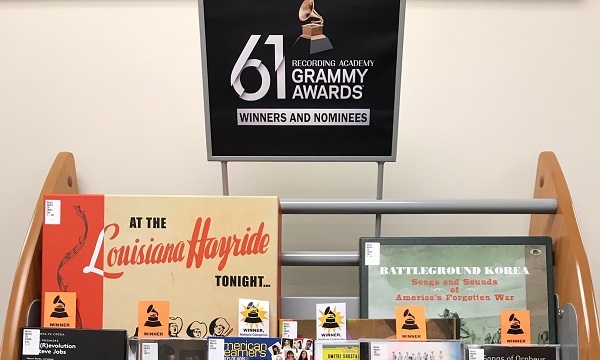 The Duke Music Library is pleased to unveil a new collection spotlight of recordings nominated for the 2019 Grammy awards, featuring more than 80 albums from just about every category you’ve heard of – and some you might not have! In addition to some of the finest recordings from the last year in Opera, Musical Theatre, and Classical, this collection spotlight includes Cardi B, Ariana Grande, Kacey Musgraves, Beck, Fred Hersch, Drake, Joshua Redman, Kurt Elling, Buddy Guy, High on Fire, and many more. Fred Hersch and company continue to find new and innovative modes of expression within the jazz piano trio context. Featuring new Hersch originals alongside fresh interpretations of a few standard tunes, this album really shines, both in recording quality and inspired live performance. Metal lifer Matt Pike gets the big nod after a year in which this release was not even the best thing he put out (that distinction would go to his other band Sleep’s album ‘The Sciences’). It was also a year in which he had a public struggle with diabetes that cost him a toe and grounded a large part of the tour for ‘Electric Messiah’. That said, when the award was announced early in the Grammy ceremony, the cameras spent many long seconds scanning back and forth looking for the winners in a mostly-deserted theater. Finally, from way in the back, Pike hobbled forward with the help of a cane, and accompanied by his metal peers, to accept his shiny statue. “We never really need an award for doing what we love…” was part of Pike’s on-stage comment, but the commendation was very cool all the same. The new Kernis Concerto was written for Canadian violinist James Ehnes, and it really serves as a showcase for Ehnes’ strengths. He comes across as such an intelligent musician, really playing with (not just in front of) the other members of the orchestra – Kernis gives them some great moments of interplay here. This work also balances Ehnes’ ability to deliver beautifully straightforward, unfussy lines one minute and astoundingly virtuosic cadenzas the next. Oh, and apparently he watched his Grammy win on a live stream in his neighborhood grocery store parking lot. How much more Canadian and unpretentious can you get? Come over to East Campus to see these and browse through many more on our display of CDs. Don’t have a CD drive on your laptop anymore? No, neither do we! Borrow a portable DVD/CD drive while you’re here. Wayne Shorter’s immersive Emanon, packaged with its accompanying graphic novel by comic book artist Randy DuBurke. The Berliner Philharmoniker’s 6-disc box set (4 CDs and 2 Blu-ray discs), The John Adams Edition, featuring the music of legendary minimalist composer John Adams, with photographic artwork by Wolfgang Tillmans. Recorded during the orchestra’s 2016/2017 season during which Adams served as Composer in Residence. At the Louisiana Hayride Tonight, a massive 20-CD box set with 224-page hardcover book documenting the storied radio program broadcast live from the Municipal Auditorium in Shreveport, Louisiana between 1948 and 1960. Includes a previously unreleased recording by Hank Williams, as well as rare gems from Johnny Cash, Kitty Wells, Elvis Presley, and many more. Battleground Korea: Songs and Sounds of America’s Forgotten War brings together an assortment of songs, news reports, public service announcements, and other spoken-word audio (including a plea for blood donations from Howdy Doody) on four CDs, accompanied by a full-color hardcover book featuring song and artist information, record covers, advertisements, propaganda posters, and rarely-seen photographs from the war.